Small but powerful, this miniature Shakyamuni Buddha statue is part of H.E. Tsem Rinpoche's personal collection of Buddha images. Imbued with Rinpoche's wisdom and compassion energies, this crystal-studded portable statue is perfect for all your travels, granting protection, blessings and peace of mind. 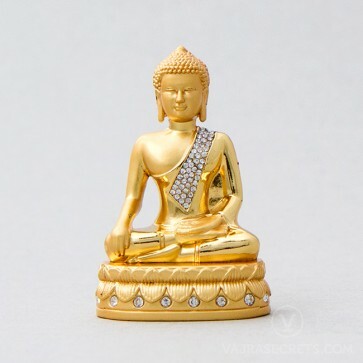 A miniature Shakyamuni Buddha statue from H.E. Tsem Rinpoche's personal collection of Buddha images. Small yet supremely powerful, this crystal-studded portable statue is perfect for travelling, placed in the car or as part of a travel altar. This statue is imbued with Tsem Rinpoche's extensive prayers and practices, altruistic energies, enlightened activities and attainments of Compassion and Wisdom, thus granting tremendous blessings and protection, and helps to avert obstacles for a safe journey.